Signature Brew is a fantastic every day, table sake. It is very easy to drink, well balanced and exceedingly versatile when it comes to the range of temperatures it can be drunk at. 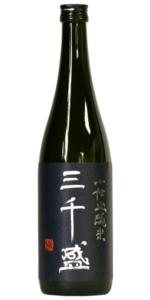 Futsushu is the bulk of the sake produced in Japan, it is the most consumed, and – as is the case with Signature Brew – can be most delicious. Although Signature Brew is a futsushu and so, strictly, a ‘non-premium’ sake, Michisakari have gone beyond what you would expect and polished the rice to 60%: ginjo levels! This sake has a smooth and full nose of banana and melon. Once in the mouth the flavours of cereal, rice and caramel are supported by good acidity and body resulting in a rich, smooth and dry pallet. The aftertaste is lingering, dry and morish. Stronger flavoured foods match well with Signature Brew: barbequed chicken, Chinese barbeque ribs, sweet sauces, mushroom risotto, etc. Signature Brew represents an excellent everyday sake.